The Don River Valley Park has had a core group of volunteers since we’ve launched. These Park Advocates spread the word about the Park and our programming, help run events and more. Joanne Quinn has been an Evergreen volunteer for more than three years, and a Park Advocate for the past year. 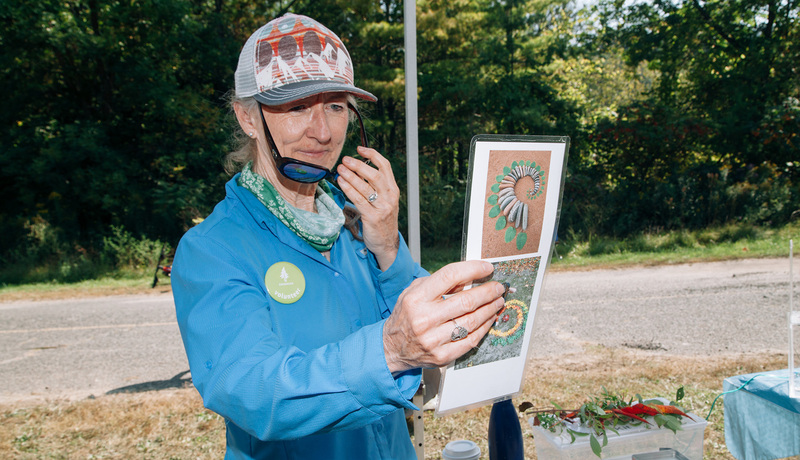 Her passion for Toronto’s ravines is evident in her desire to bring people back to the Valley. She talks to us about her passion for the Park and volunteering. DRVP: What drew you to the Park Advocate group? JQ: I grew up in the East End way out in Scarborough, and it was all farmland when I grew up. One of the places we always played was in the ravines. My family grew up in this area of the city and I know when my grandparents were here, they all used the ravine areas. The point of the group is to spread the word and let people know that the Park is there. That’s the big part for me, as an advocate, just spreading the word that it’s just an amazingly huge area that city dwellers can use. You can walk down there and it’s like you’re in another world. It’s pretty delightful that people in the city will get to use it just the way we did as kids. Joanne Quinn at Ravine Days in the Don River Valley Park in Toronto/Yuula Benivolski. DRVP: What has volunteering as a Park Advocate brought to your life? JQ: It’s just a great way to be part of a community. The type of volunteering is really specific to my interests, so the people I’m meeting are becoming good friends. It’s just a wonderful way to contribute. There’s lots of other work to be done, and if everyone plays a little bit of a role it forwards the cause of an organizations like Evergreen. I’m amazed at how much gets done by the volunteers. The power of volunteers is pretty incredible and I’m so glad to be a part of it. DRVP: What do you wish people knew about the Park Advocate group? JQ: I think it’s a marvellous way to contribute to the community. A lot of people might not be aware that the Park is even there. People have this fabulous resource to use with their families, as individuals, with their school groups, so it’s really important to let people know about it. The Park Advocate group is a useful and worthwhile way to get the word out about this awesome space. Interested in joining the group or volunteering in our programming? Check out our current opportunities for more or stay up-to-date on all the Park news by signing up for our newsletter.